The Head of the Charles Regatta, also known as HOCR or HOTC, is a rowing race held on the penultimate complete weekend of October each year on the Charles River, which separates Boston and Cambridge, Massachusetts. The race is named the “Head” of the Charles because it is a head race. It is the second largest 2-day regatta in the world, with more than 8,900 athletes rowing in around 1,750 boats in 56 events. It attracts about 300,000 spectators throughout Regatta weekend. The Head of the Charles Regatta is run by an office of 3 and approximately 1,500 volunteers. The regatta is hosted by Cambridge Boat Club, a rowing and social club founded in 1909 that lies just before the Eliot bridge, on the Cambridge side of the river. ~ by shooter1 on November 8, 2011. 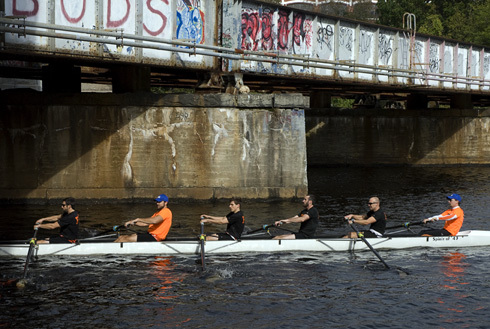 This entry was posted on November 8, 2011 at 1:21 pm and is filed under Head of the Charles Regatta, Street photography.You can follow any responses to this entry through the RSS 2.0 feed.You can leave a response, or trackback from your own site. Next: Beacon Hill, Boston, Halloween 2011.